This international symposium explored the phenomenon of ‘garnitures’ or matching sets of vases and how they were used in the European interior. Displayed above chimneypieces, cabinets and cupboards or over doorways, they embellished or ‘garnished’ the interior and enhanced the status of the owner. 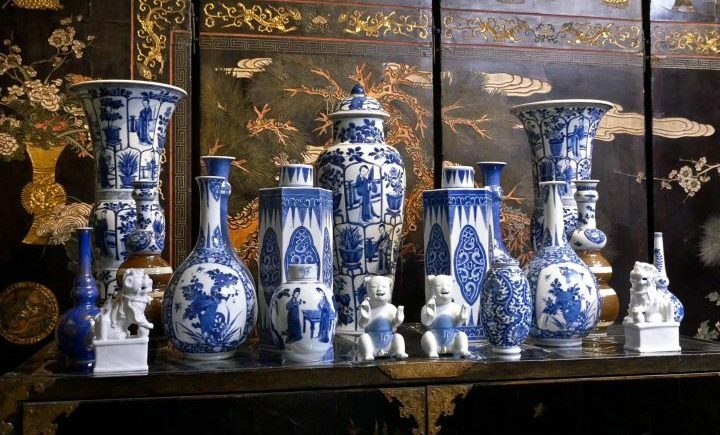 The fashion began in Europe in the 1640s using mismatched porcelain beakers, vases, bowls and jars, imported from China. By the 1690s, purpose-made sets with matching decoration were produced in China, Japan and Europe. The fashion continued well into the eighteenth century with almost every ceramic manufactory producing examples. The symposium will also explore how contemporary artists are re-interpreting vase sets in modern and historic interiors. Speakers included Patricia Ferguson, Suzanne Lamboy, Dame Rosalind Savill, Tamara Préaud, Julia Weber, Edmund de Waal, Reino Liefkes, Yu-Ping Luk, and Matt Smith. The exhibition catalogue, Garnitures: Vase Sets from National Trust Houses, by Patricia F. Ferguson (V & A Publishing) is now available in both paperback and hardcover.